Both largely praised and controversial to readers, it's safe to say that news of Alan Moore & Brian Bollard's graphic novel getting its own film adaptation was met with large amounts of attention. But a hurdle lay in the storys slim nature, meaning extra material had to be added in, otherwise the animation would have to be relegated to a short. Thus a prologue was added onto the picture, and the result can accurately be described as a mixed bag. It's clear what the thought process was behind the prologue, to establish Batgirl as a character in her own right, prior to the events which occur and turn her into a victim. What's unfortunate is how problematic the handling of the character becomes, as Brian Azzarello's script leaves her as an object of desire who's easily led into traps, as well a jilted love interest, hung up on Batman and committing assault on brutish civilians. Even more shameful is how this comes at the expense of delivering some form of character development, leaving an otherwise strong character like Batgirl to come off worse than a mere adaptation of the Moore/Bollard one-shot. Not helping matters is how disconnected it feels from the main material, with unfolding events holding next to no connection to the main story, never being referenced. One can't shake the feeling this material was tacked on from a solo Batgirl film, as opposed to delivering something that naturally weaves into the original story, touching upon its themes even further. 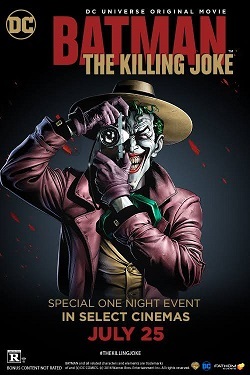 However, when the film finally gets around to adapting The Killing Joke, one can feel the quality getting turned up a notch. Granted, that's more to do with Alan Moore's original tale being followed rather closely, but it remains a dark and gripping thriller. Touching on the relationship between Batman and The Joker, Batman: The Animated Series veterans Mark Hamill and Kevin Conroy lend terrific voice work to the adversaries, feeling like veterans locked in a battle they've waged for quite a while. A nice counterpoint is the flashbacks to a young version of The Joker, as one witnesses the characters unfortunate backstory (which can easily be dismissed for viewers who prefer not knowing, thanks to a line that's very in-character). Tara Strong and Ray Wise do good jobs lending their vocals to their characters. The animation is competent, but considering the wondrous art Brian Bollard gifted the original story with, one can't help but wish things were stepped up from the traditional fare delivered by Warner Bros. Animation. Batman: The Killing Joke is a glaring example of how ill-fitting two halves of a film can be. Had more care gone into the first part, viewers could have been gifted with one of the better DC Animated movies, rather than merely one half of one. However, it's nice to see the ambiguity of the ending was left into the final product.